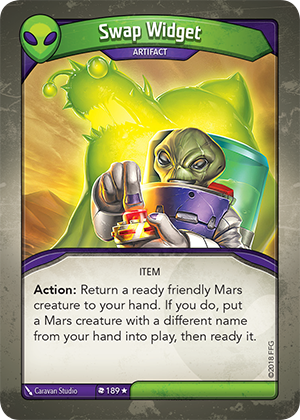 Card Text Action: Return a ready friendly Mars creature to your hand. If you do, put a Mars creature with a different name from your hand into play, then ready it. Can I use Swap Widget’s “Action:” ability, even if there are no friendly Mars creatures in play (for effects like “Each time you use an artifact, gain 1 Æmber”)? If a creature is put into play through Swap Widget’s “Action:” ability, does it trigger “Play:” abilities for that creature (if any)? No. “Play:” abilities only trigger when a card is played, not when it is put into play.